Things we see every day can almost fade from view. But failure to notice high voltage power lines can be a deadly oversight. Safe Electricity wants to raise awareness about the dangers of overhead power lines and the precautions to take around them. Often, when we undertake outdoor activities, we don’t even think about power lines. Taking a few moments to become aware of your surroundings is a critical step to keeping yourself and your loved ones safe. Look up and around you. Always be aware of the location of power lines, particularly when using long metal tools, like ladders, pool skimmers, and pruning poles. Lower your long equipment when moving it. Carry ladders and other long items horizontally. Never trim trees near power lines – leave that to the professionals. Never use water or blower extensions to clean gutters near electric lines. Contact a professional maintenance contractor. If your projects include digging, like building a deck or planting a tree, call your local underground utility locator before you begin. Never assume the location or depth of underground utility lines. This service is free, prevents the inconvenience of having utilities interrupted, and can help you avoid serious injury. 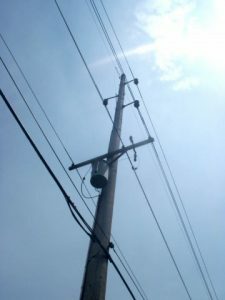 Another instance when people often come in contact with power lines is through vehicle crashes. In accidents that bring down power lines, our instincts tell us to flee danger. However, it’s almost always best to stay in your vehicle and wait for help. Call 9-1-1 and wait until the utility arrives and ensures the area is de-energized. If you must get out because of fire or another danger, jump clear of the vehicle without touching it and the ground simultaneously. Then hop with feet together —don’t run or stride. Electricity spreads through the ground in ripples, like a stone dropped in water. The voltage is highest in the ring closest to the vehicle and decreases with distance. Hop with feet together, so one foot won’t be in a higher voltage zone than another, which could make you a conductor for electricity. If you come upon, or witness an accident involving toppled power poles and lines, don’t leave your vehicle to approach the accident scene. Often, our inclination is to step in and help those in danger and offer assistance to the injured. However, in accidents involving power poles, the best thing you can do is call for help. Wait for trained assistance to arrive, or you could become an additional victim needing rescue.